Sanlúcar native Paco Yuste always has known where he was going and what he needed to do to get there. Determination is one of three-hundred pound Paco’s primary attributes. Physical presence is another. He is not a man one gets in the way of, nor is he one easily dissuaded from his path. After a long and successful career as an almacenistas, a specialty broker who buys young wines from farmers, ages them in soleras on his own premises and in turn sells mature selections to large producers, Paco Yuste has risen beyond this elite merchant status and added a new role to his resume. He has become a preserver of classic old Sherry bodegas, some containing rare soleras started over a century ago. In California we’re getting acquainted with Paco Yuste through his amazing Aurora Sherries, available in our market for just over a year. But in Sanlúcar, Paco Yuste is a VIP with high visibility, someone widely respected for his thirty-year career as one of the region’s premiere Sherry merchants. More recently Paco’s ongoing efforts to rescue some of Sanlúcar’s oldest bodegas from complete dilapidation have gained him an almost spiritual status to the locals as a preserver of a key part of their indigenous culture. Without Paco’s willingness to step in, it’s likely that a classic piece of Sanlúcar history would disappear forever. Here’s the back story. Old-timers remember Paco Yuste as the man who brought Coca Cola to Sanlúcar. He made good money in this role and soon was able to indulge his real interest in life, producing fine Manzanilla Sherry. Paco’s roots are in Sanlúcar. Perhaps that’s why he overachieved quickly as an almacenistas. His native understanding of Sanlúcar’s twin terroirs – both the Albariza soil, a gift of the nearby Atlantic, a major influence on the development of the region’s unique native flor, and the local bodegas where this singular flor has enjoyed steady cultivation for generations, seemed to come naturally to Paco. His Manzanillas were delicious and immediately sold very well. But while Paco was succeeding, others were not. Changes in the marketplace left many classic Manzanilla producers in the rear view mirror. Ongoing industry consolidation made it increasingly difficult for the old masters to compete. One after another they were forced to close. Many classic bodegas shut down completely, often abandoning priceless soleras that took generations to build. Too many centurion soleras literally were left to the birds (and their effluvium). In the teeth of these grey circumstances Paco Yuste saw golden opportunity. He decided to rescue some of the old bodegas and obtain their soleras for his own blends. His initial purchase of a bankrupt bodega was in 1991. Although Paco’s acquisition of 100-year old Bodegas Santa Ana was a significant purchase, it was only his first followed over the course of a decade by others including Bodegas Miraflores in 2001, a keen addition that brought along a historic 46-hectare Pago (vineyard) called Viña La Alamedilla. Fine Sherry soleras take years to develop. It’s a slow but steady process, like building authentic brands in a complex and competitive market place. Paco Yuste knows this. It’s why he’s taken his time. Securing superior stock was a strong start. Finding the right image to portray and promote his new brand was the next step. Paco did a lot of research and along the way he found a series of advertising posters of a striking women named Aurora from the early 1900s, Sherry’s golden days. He adopted the seminal image of Aurora as the face of his new (revised) brand. 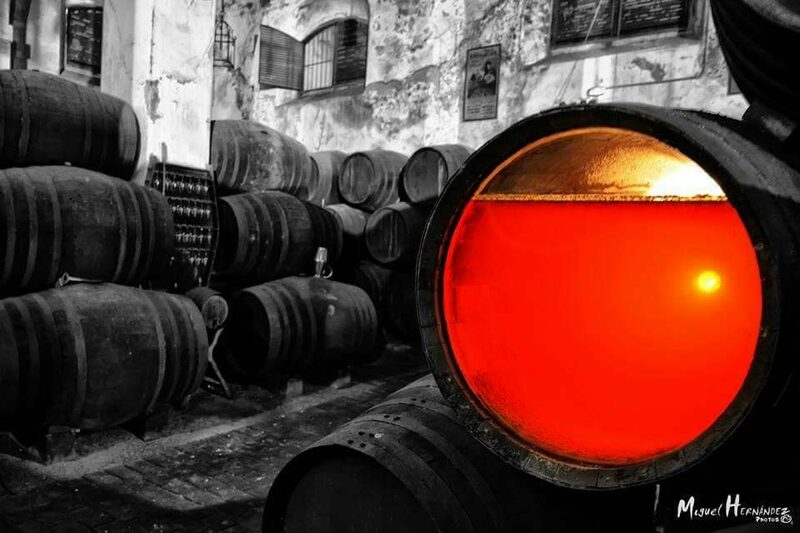 Paco feels Aurora’s historic image captures an essential truth about great sherry – old is beautiful! Since debuting a scant year ago, Paco Yuste’s Aurora Sherry selection has exceeded expectation. Customers initially are drawn to the labels featuring colorful classic poster images of Aurora. Strong labels are a positive no doubt, but quality is what has taken the highly discriminating Sherry community by storm. 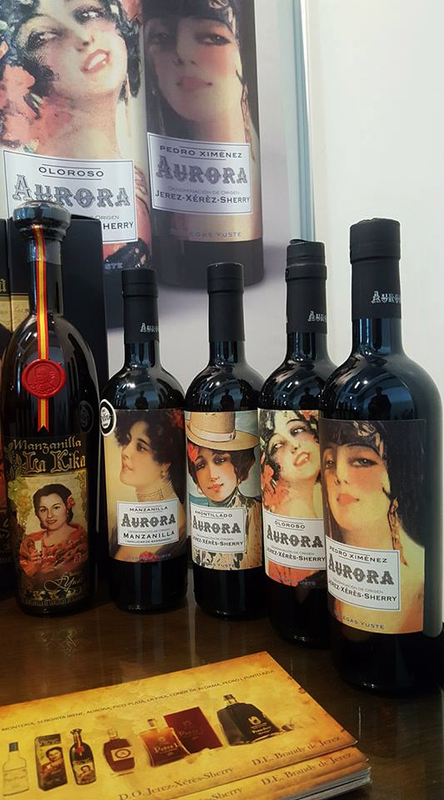 The Aurora selections are as good as any other Sherry set in town and the Paco Yuste story is too good to keep secret. The combination is smart. It has to be because as Paco Yuste himself will be happy to tell you, we can’t let Sanlúcar and Manzanilla down. Cheers! Pasada is the most delicate and the oldest style of Manzanilla. Most Pasada Manzanillas are around seven years old when they are released. Yuste La Kika is a minimum of 10-years old upon release. It’s hand-bottled from selected botas (individual aging barrels) at Paco’s top estate, Bodega Santa Ana in the heart of Sanlúcar. Most significantly, La Kika is dedicated to Paco’s late mother. In Sanlúcar there are no higher tributes and in the world of Manzanilla Pasada there are no better examples. Yuste’s signature expression comes from skillfully blended components from multi-century soleras. No one else in Sanlúcar is blending 19th & 20th century soleras recovered from bank-rupt old bodegas, with modern soleras (eight to ten years old) based on exceptional sources like Paco Yuste’s Pago Vina La Alamedilla. Not surprisingly Paco Yuste’s PX is a full boat version with tantalizing aromatics and a penetrating but lively sweetness on the palate that can come only after careful, prolonged aging. Quality can’t be rushed!